Tag line: "And now! At Last! Another film completely different from some of the other films which aren't quite the same as this one is." I grew up watching reruns of Monty Python’s Flying Circus on public television (which, in the Philadelphia area, was broadcast every Saturday night at 11 p.m). While in many ways an extension of the skit format that made their show a smash, Monty Python and the Holy Grail also gave the boys a chance to narrow their comedy by exploring a single topic, making it the best of both worlds for Python fans. Oh yeah…it’s damn funny, too. King Arthur (Graham Chapman) is searching for the bravest knights in the land to join his court at Camelot. On his journeys, he encounters many noble knights, including Sir Bedevere (Terry Jones), Sir Galahad the Pure (Michael Palin), Sir Lancelot the Brave (John Cleese), and Sir Robin the Not-Quite-So-Brave-As-Sir-Lancelot (Eric Idle), all of whom swear their undying allegiance to him. Once assembled, Arthur and his knights are given a divine task, assigned by God himself: seek out the Holy Grail. The search for the Grail is a perilous one, and the knights must outwit, among others, the gruesome knights who say ‘Ni’, a wizard named Tim (Cleese), and a ferocious, man-eating rabbit that might just bite their heads off. 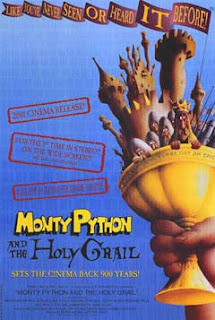 Though it does follow a specific narrative, Monty Python and the Holy Grail relates its story by way of some very funny vignettes, seemingly unrelated parts that. when merged, form a hilarious whole. In an obvious spoof of the Middle Ages' low mortality rate, a man (Eric Idle) follows a cart through the streets and, banging a pot, exclaims “Bring out your dead”, at which point people start dragging deceased family members from their homes, as if it were trash collection day. Even Arthur himself isn’t above reproach, and is afforded none of the honors normally bestowed upon a king. To begin with, he doesn’t own a horse; instead, his manservant, Patsy (Terry Gilliam), follows him around, striking two coconuts together to make it sound as if Arthur were trotting along on horseback. Then, he has to deal with a couple of peasants (Michael Palin and Terry Jones) who argue with him over the proper way to appoint a national leader (“King eh? Very nice. And how'd you get that? By exploiting the workers. By hanging on to outdated imperialist dogma”). From there, it's off to a castle, where he's ridiculed and taunted by a particularly rude French knight, played by John Cleese (“I don't want to talk to you no more, you empty headed animal food trough wiper. I fart in your general direction”). As if all this weren’t enough, Arthur finds he must battle the dreaded Black Knight (Cleese again), a valiant warrior who never gives up…even after losing a limb or two. By the end of Monty Python and the Holy Grail, the boys will have added more than a few rough edges to Arthur’s legendary Round Table. Simply my mostest favorite movie ever. It turned me into a newt...I got better. I watched this so much on VHS the tape is stretched. Keep up the good work Dave! Fred: Thanks for stopping by! This is a definite classic, and I'm pretty sure my brother and I wore out the video as well. It's THAT good! Thanks also for the kind words, and I'm glad you're enjoying the blog! Such a tricky film to review. You did a good job. Definitely one of the best comedies I have seen. Steve: Yeah, this one can be tricky, but I had to include it. It's one of the finest comedies ever made! Thanks for the kind words, and for stopping by. I appreciate it.